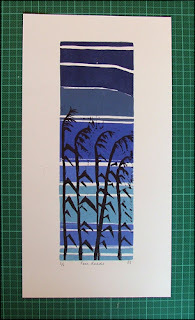 Also finished is Fen Reeds, inspired by our post Christmas walk on Wicken Fen (or at least near Wicken Fen, what with us forgetting our NT cards and not being able to get in to the posh bit). Our main website is due an overhaul to add all the new prints and generally tart things up a little, so do keep your eyes peeled for that over the coming weeks! Spent the weekend finishing off a tiny engraving on an offcut of unidentified end-grain wood, possibly maple, part of the mixed bag we bought a few weeks ago. It felt strange to be engraving on wood at first, after weeks of plastic and resingrave, but it was nice not to have to worry about the surface chipping or lifting away! 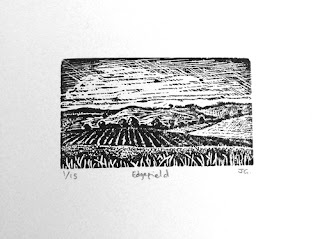 The engraving was based on a sketch of fields around Edgefield, near Holt in north Norfolk, from a long walk we had last summer on the Holt-Mannington trail. The simple patterns of hedges and plough furrows suited the small area of the block (about 5 x 3 cm). Printing was a bit hit and miss at first and we tried lots of different methods: laying the block on the paper (with padding underneath) and pressing down with weights, laying the paper on the block and burnishing by hand, and a combination of the two, although this generally meant the block would shift and blur the print as we flipped them. We spent large parts of Sunday night looking longingly at presses on the internet! 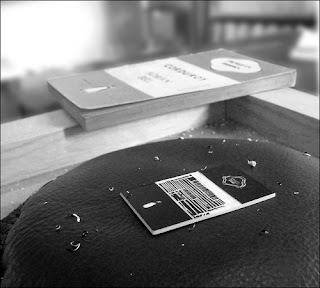 While I was engraving on Saturday afternoon Sarah took it upon herself to create a neater way for me to store my tools, which since I've bought them have lived variously in a roll of bubble wrap, in an old Stilton and Port tin, and scattered across the dining table. 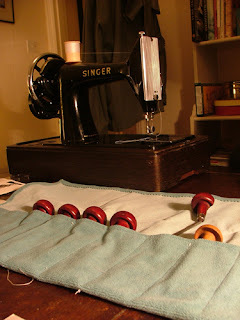 Now they have their very own little roll, courtesy of some old curtain fabric from Freecycle, and Sarah's 1950s sewing machine (a hefty lump of splendid engineering). 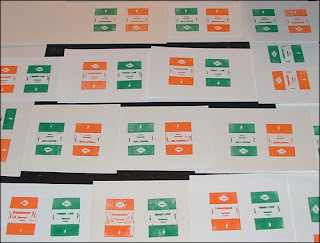 On Friday we drove off to the Post Office depot to pick up our new printing block, a chance purchase from eBay. 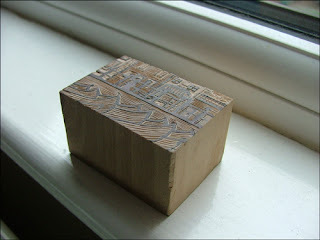 The block itself is 9 inches square and about 2 inches high, made from several pieces of wood joined together, with the design made up of various metal shapes pressed into the wood. According to the seller it was originally used by Liberty to print fabrics, and looks like it might be one block from a larger repeated pattern. It looked good just sat on the shelf, but obviously we couldn't have it and then not print from it, so yesterday we had a bit of an experiment. The thin, sharp metal surfaces were tricky to ink with the roller, so we ended up doing the fiddly bits with a brush. End result was great, a really sharp and interesting print. 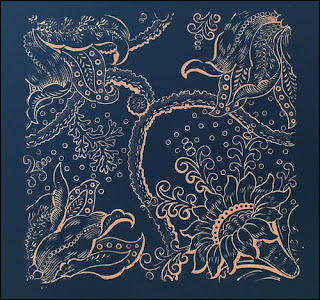 Perhaps a good chance to use our gold and silver inks, maybe on black paper... The colours of the image below have been inverted to show the pattern more clearly. 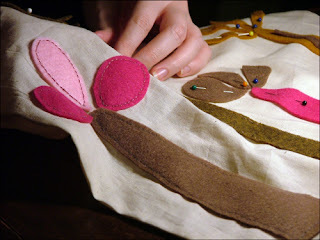 In other news Sarah has been busy beavering away with felt and linen bags. The anti-plastic bag revolution continues! Currently listening to: Bonnie Prince Billy, The Letting Go. 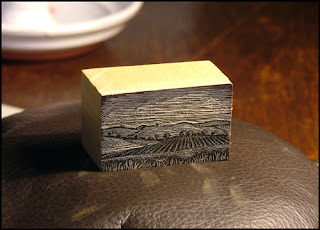 Since doing the Christmas card (see earlier posts) there have been a couple of small pieces of engraver's plastic lying around, and on Sunday we decided to make use of one of them and do a tiny print based on the classic Penguin paperback design. We have a growing collection of these and it seemed like a nice little project for a weekend afternoon. By that evening it was engraved and we'd printed it up in orange (used by Penguin for fiction covers), followed the next morning by green (mystery and crime, see below). We then added a pink (travel and adventure) and a blue version (biography) to finish it off. 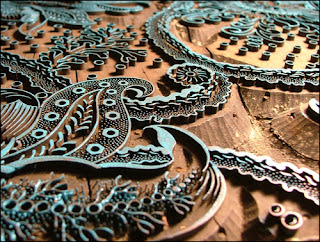 You can see the finished print here on our Flickr page. Currently listening to: Clap Your Hands Say Yeah!